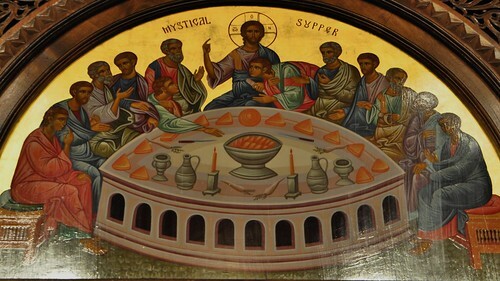 On Holy Thursday we contemplate the institution of the Mystical Supper – we realize that Christ gave His Body and Blood for the life of the world so that we can partake of salvation! The institution of the Eucharist by our Lord is something we not only think about, but actually receive when we come to the Liturgy this evening. O how manifold and ineffable this communion! Christ became our brother, partaking of the same flesh and blood with us, and through them became like us. Through his blood He has redeemed us for Himself as true servants. He has made us His friends (cf. John 15:14-15) partaking of this blood He has bound and betrothed us to Himself as a bridegroom his bride, and become one flesh with us. 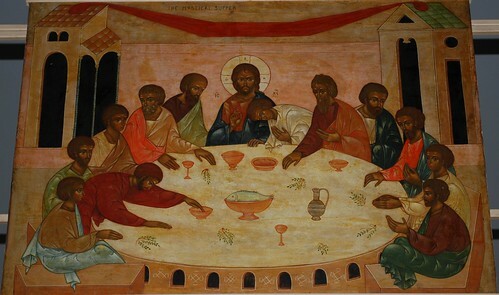 He feeds us not only with blood instead of milk, but with His own body, and not only His body but also His Spirit. In so doing, He always preserves undiminished the nobility given to us by Him, leads us towards greater longing, and grants us to fulfill our desire, not only to see Him but also to touch Him, to delight in Him, to take Him into our hearts, and for each of us to hold Him in our inmost selves.